This is Going to Happen, Not If But When. This is why you must be positioned and make monthly purchases and/or buy the dips, because when this blows the only thing that will be left is confetti paper. The Silver market is small and somewhat controlled and has been for years. That maybe about to change. 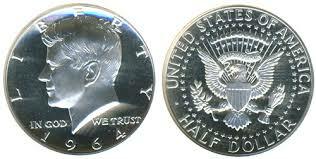 President John F. Kennedy was that last president to defend and support silver coins while he was alive. After that President Lyndon B. Johnson did away with all that with the1965 coinage act and soon after no coins contained silver. Johnson explained it was rare and running out of supply, Back in 1965! You can Read his Remarks here at the Signing of the Coinage Act. The world’s foremost silver analyst Theodore Butler has done it again. He has elaborated another bullish factor so powerful it screams at us to buy silver. As you know, Mr. Butler is the supreme expert on futures trading in silver. The reason that this knowledge is so important is because the COMEX is the primary place where silver prices are set. Forget about China, the dollar, the economy or whatever reason the media reports. Billion dollar banks, hedge funds and computerized trading monolith’s set the price on the COMEX. What Mr. Butler’s brilliant analysis has uncovered is extremely complex, so I’ve had to simplify it so I could understand it myself. Over the years, he has pointed to the technical hedge funds as the big buyers and sellers who move prices up and down. The big banks such as JPMorgan take the other side of these trades. These technical funds usually go long as prices rise and short as prices fall. They trade in and out of their positions based on price movements. Over the past three years, a new type of hedge fund buyer has emerged. Mr. Butler calls them the core non-technical funds. They don’t trade, they buy and hold. From late 2013 to the summer of 2015 their long position grew to 40,000 futures contracts and more recently to 60,000 contracts. That’s 300 million ounces of silver in this core long position. These are longs who are holding and waiting for higher prices. They use futures as their silver investment vehicle because of the leverage available. According to Mr. Butler, there are two other types of silver buyers, small traders and the other large reporting traders. Together, he estimates their total long position to be 20,000 contracts. That makes a total of 400 million ounces held on a long term basis when adding up all categories of permanent longs. Mr. Butler writes, “The 400 million ounces of paper silver held by long term investors on the COMEX must be viewed in the context of how much actual metal exists in the world and how much could be secured from new production. The problem is that the numbers don’t match up. We have a distinct mismatch between what is held by traders thinking they ‘own’ silver and the amount that exists or could possibly be considered available. “In silver, the COMEX core long position of 400 million ounces is more than 25% of all the silver bullion in the world and nearly 50% of the visible portion of that total. And with no more than 100 million ounces of new silver available from mine production each year (after total fabrication demand is accounted for), how the heck could you draw 400 million ounces from that? I know how futures markets are supposed to work and the numbers in silver say it can’t possibly work. Not enough actual silver exists to satisfy and back up the core long position in COMEX silver futures. It’s not even close. “So, if there doesn’t exist the amounts of silver in the world to back the contracts held by the core long holders in COMEX futures, then what exactly is backing those contracts? The answer is 8 large short traders on the COMEX. That’s because CFTC data show in the last COT report that 8 large traders held 93,283 net contracts short, the equivalent of just over 465 million ounces. Not one of these 8 short traders is a mining company, although one of the short traders, JPMorgan, is protected against the loss of rising prices by virtue of its 550 million ounces actual silver holding. Without JPM, only 7 large traders, holding around 70,000 contracts short are backing up the core long position. “It’s easy to see why there would be a large core long position in COMEX silver, given the low price and the lure of leverage and giant potential profits. But flip the equation around and try to come up with a legitimate reason for why anyone would want to hold a short position in silver at the same low price and with all the obvious risk factors attached? The only answer is that they think they can manipulate the price lower. However, they may well have trapped themselves. Bear in mind that when all participants in the futures markets are added up, the total short position is 750 million to 800 million ounces. No other commodity has the stark configuration of silver.